This sail has a 5.4 oz NYT radial foot 5.4 oz firm body. 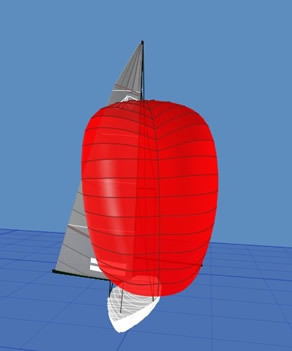 The radial foot allows the lower portion of the sail to be fuller for light air and yet automatically flattens as the wind increases. The sail is flatter that the V-1 and is built from 5.4 oz NYT cloth with bigger patches for more durability. The V-1 Jib is the class standard light to medium air jib. The full round entry of this sail make it very easy to steer to and keep going fast even as the chop builds. This sail is designed for 0-15 knots of wind and overlaps with the A1 Jib. The XC Monster is a cross cut nylon spinnaker that is the most powerful Soling runner on the market. Designed for windward/leeward courses, the runner is a very forgiving sail to trim. This sail is made from Soling class minimum cloth weight. The Mini spinnaker is designed to be just the right sail for reaching in strong breezes or very light air. The sail is designed with a deep radial head cross cut body and minimum weight cloth.